I had always been interested in fitness and health. In high school, I dabbled in yoga and other workouts, played soccer for a year, and kept generally active. I was never an athlete though and never in tip top shape. Then I went off to collage and gained more than my fair share of the Freshman Fifteen. It didn’t really bother me too much though and I never did anything about it, even after college. 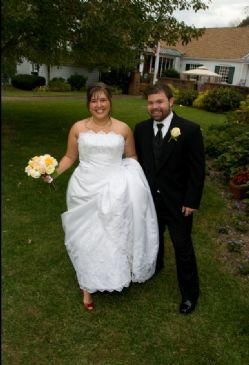 Then , in October 2008, I married my best friend. When I came back from my honey moon, I weighed myself and was my highest ever at 192 pounds. At that point, I was sad at the idea of gaining any more and frustrated with things that I couldn’t do because of my lack of fitness. I wanted to be able to do things with my husband like snowboarding and biking without being winded immediately. January 2010, I started dabbling in Weight Watchers. I got materials from my sister and tried doing it on my own but that wasn’t going to work since I was still eating poor quality calories. I just couldn’t get full on what I ate. I didn’t know how to eat right. I started adding workouts in here and there and really got into a routine using “My Fitness Coach” on Wii. That helped me at least start to workout on a regular basis. In June 2010, I asked a close friend was website she used to track her food. She pointed me to Spark People and I loved it from the start. 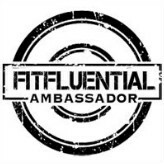 Not only was it a free health site geared toward overall health and fitness, but it had a whole social networking aspect to it too. I started blogging and making friends. Having those friends there for me really kept me accountable and on track. I still continue to blog there almost every day and try to support those friends who have been there for me many times! 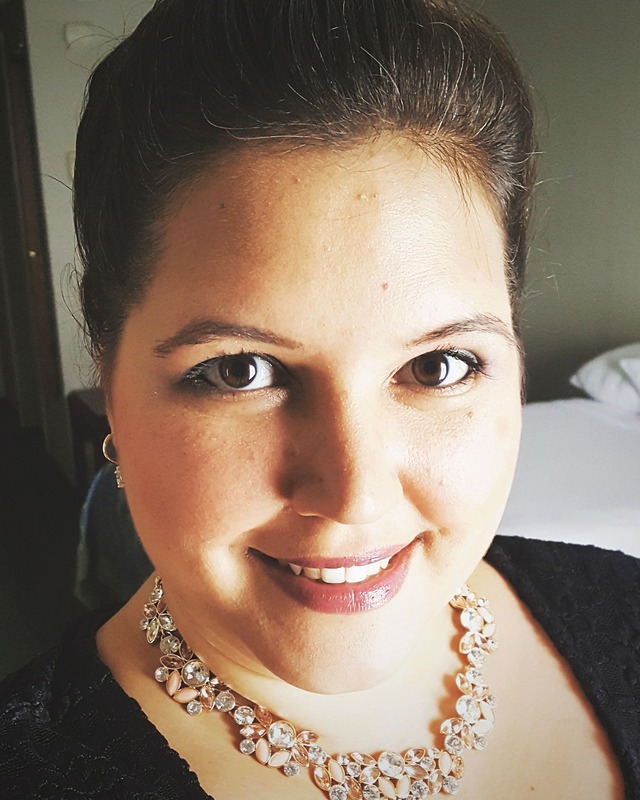 Having this support group was critical in my weight loss journey. On top of having this new tracking and social health site, I promised that same friend that I would run a 5K with her in September. 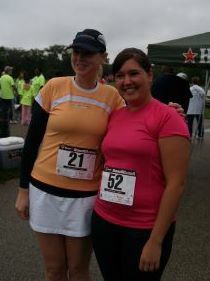 It was a special 5K for her, in memory of a friend, so I couldn’t even think about backing out. I immediately started training using the Couch to 5K program. 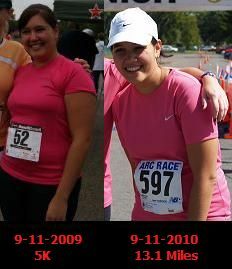 I ran that 5K in September and I continue to sign up for various distances, with my first Marathon planned for 2012! It took me a year but through all that hard work and determination, I was able to lose about 50lbs. Now, the hardest part is ahead of me to maintain that loss. I’ve grown to love healthy eating and fitness, embracing it in my every day life. While maintaining this lifestyle will always be on my mind, it won’t be a burden since I enjoy it so much! Find a Support Group – Whether it is in person or just online, find someone who will cheer you on when you succeed and help you back up when you crash. Having someone there to help you through it is critical for success! Track Your Food – You might not like doing it and you might not like measuring everything but you need to do it. You might be eating way more than you think or maybe you aren’t eating enough. Either way, find a trusted site like Spark People to tell you how much you should be eating and work from there! Get Moving – Even if its just 10 minutes a day of marching in place, that is more than 0 minutes a day of movement. Add a little bit of activity into your routine on a regular basis. It doesn’t have to be every day, but remember that it takes something like 6 weeks to create a habit. Eventually, you might be hitting the gym daily but that’s not going to happen right away. Do something small and stick with it to get your started. Drink Your Water – It just makes you feel healthy. Besides, in the first few days you will drop a few pounds immediately just from flushing out excess sodium. It does nothing but good things for you body. Work your way up to those 8 glasses a day! I know it is a struggle to get started but I hope you find something that works for you. There is something for all of us out there that will make us get into gear. For me, it was sheer determination. I decided one day that I was going to lose the weight. So I started doing things to get me there. I couldn’t sit around any longer day-dreaming about it. I knew I had to do something about it! You have the same will, you just have to apply it!